Toyota is planning to launch a face-lifted Altis with a 1.6-litre petrol engine (instead of the present 1.8-litre engine) in April 2011. The face-lifts also include a new front bumper, larger grille and redesigned tail lamps. The new Toyota Corolla Altis with the 1.6-litre petrol engine will likely be priced in Honda City territory of Rs. 8.5 lakh – Rs. 10 lakh. According to CarIndia, the 2011 Toyota Corolla Altis has already been prepared for launch. The spy photos of test mules of the 2011 Corolla Altis surfaced on the Internet last month. The test cars were camouflaged only at the front bumper and rear tail lamps, confirming doubts about the upcoming model. The Toyota Corolla has been very popular in India over the years and continues to sell well in its new avatar, the Corolla Altis. 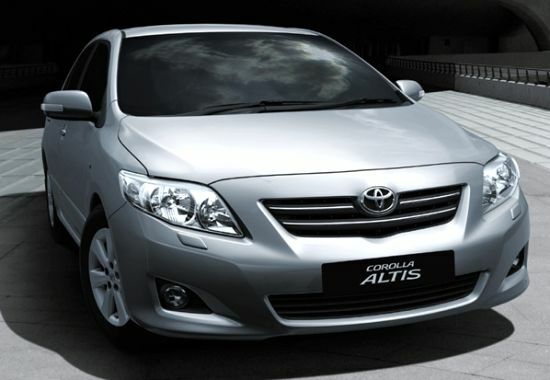 The company launched the Corolla Altis diesel last year which also has been reasonable sales. However the car is now a bit long in the tooth. The all-new Honda City has been attracting a lot of buyers, and the introduction of a 1600 cc variant of the Corolla might make buyers look at the car again.